There's no escaping it, the way we live creates greenhouse gas emissions. In fact, it accounts for some 24% of total greenhouse gas emissions, according to the US Environmental Protection Agency and roughly a third of that figure comes from house building itself. No wonder then that so much attention is being paid to greener housing such as sustainable construction and low-energy homes. But, how much is the average citizen currently aware of these issues and how much more would he or she be willing to do in the future to make their housing greener? In the latest ING International Survey Homes and Mortgages 2018, we asked around 15,000 people in 13 European countries, the USA and Australia about their current attitudes to reducing the environmental impact of their housing and what they were prepared to do in the future to reduce that still further. You can download that report here. 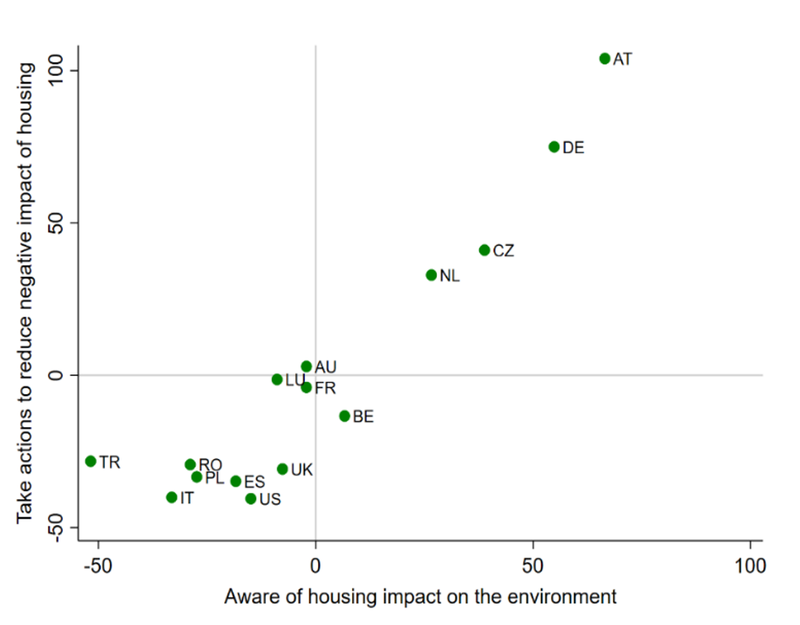 This chart gives a simple picture of the current and future attitudes to greener housing of people per country. The responses to questions indicating how much attention people paid to the effect of their housing choices were ranked to produce an indicator of current attitudes to sustainable housing. This is shown on the horizontal axis. Responses to questions indicating an intention to reduce environmental impact in the future were used to create an indicator of future sustainability. This is shown on the vertical axis. Plotting the two against each other gives a measure of current and future sustainable housing attitudes by country. The upper right quadrant (labelled I) can be considered as always green. Survey respondents in Turkey were not only more likely than average to pay attention to sustainable issues now (such as recycling and using low energy appliances) but are more likely to do so in the future, for example by installing further energy saving devices where possible. 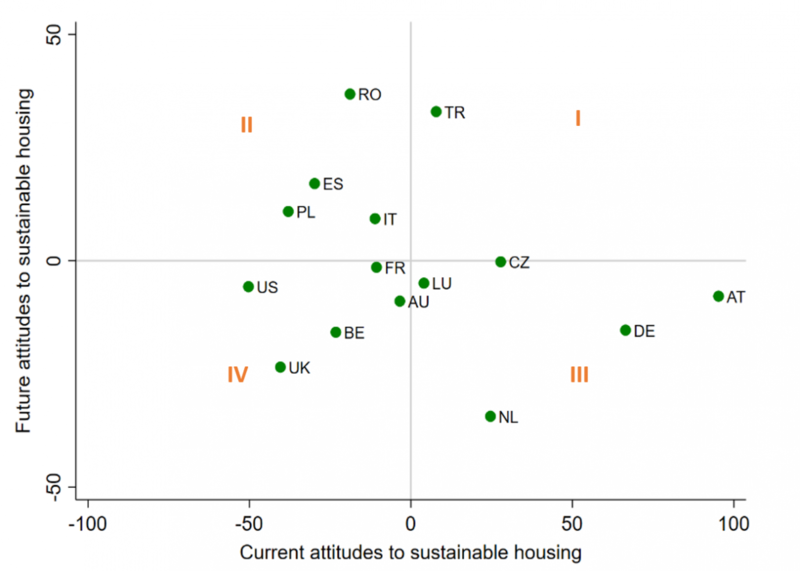 The upper left quadrant represents those countries where people hope to pay more attention to sustainable housing issues in the future, even though they lag behind at present. The lower right quadrant represents those countries where green housing behaviour already exists but is unlikely to improve further. The lower left represents those countries where responses indicate lagging behind now and lower relative expectations of improvement in the future. to become greener in the future. There is evidence of “green fatigue” which is an indication that people in these countries feel they have done enough already. Respondents from Germany, Austria and the Netherlands are less likely than average to think they could do more to reduce their impact on the environment. Furthermore, they are also less likely to respond that working together would be beneficial to the environment. We discovered that a key factor limiting the ability of people to adopt greener living was the costs involved in making their houses more environmentally friendly. However, an arguably more concerning aspect was that some consider they have already done enough. It is up to others to do more. In that sense, the problem becomes more than individuals not having enough money to make their housing more sustainable but that it is up to others to become greener. In that sense, there is a collective action problem. Given this, it is not surprising that the survey showed strong support for government subsidies to support more sustainable housing measures. In many ways, public action, when collective action fails, may be an appropriate response. Read more about the ING Greener Housing Index here.